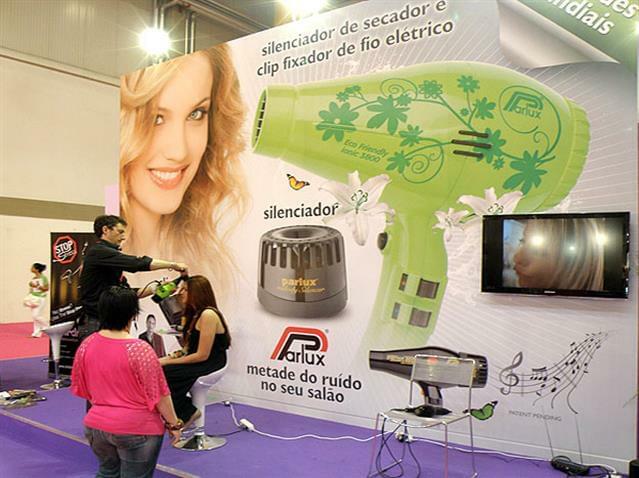 The new PARLUX products for 2011, the Parlux 3800 Eco Friendly hairdryer “the Flower of Parlux” and another incredible accessory, the Parlux Melody Silencer, created great interest among local and foreign professionals visiting the 16th edition of Expocosmetica held in Porto, Portugal, in April. Mauro Dell’Orco, a well-known Italian hairstylist, guest star at the live shows held at the booth of Errepi moda, the distributor for Portugal, showed the latest hair trends and explained the use and professional quality of these two new PARLUX products to hairdressers and also to journalists of different local broadcasting stations present at the show. The latest PARLUX hairdryers protect both hairdressers and customers health due to these features: low weight and ideal measures, good balance, less noise, energy saving and production with no toxic materials). At the same time they protect the environment and sustainable development due to the fact that they are produced using recyclable raw materials – a new ecological philosophy adopted by PARLUX. The new Parlux Melody Silencer a revolutionary product easily attached to any PARLUX hairdryers reduces the normal noise of the hairdryer thus protecting the hearing of hairdressers and customers and allowing normal conversation to take place without too much disturbance.